The brachial plexus is divided into five roots, three trunks, six divisions (three anterior and three posterior), three cords, and five branches. There are five "terminal" branches and numerous other "pre-terminal" or "collateral" branches, such as the subscapular nerve, the thoracodorsal nerve, and the long thoracic nerve, that leave the plexus at various points along its length. A common structure used to identify part of the brachial plexus in cadaver dissections is the M or W shape made by the musculocutaneous nerve, lateral cord, median nerve, medial cord, and ulnar nerve. The five roots are the five anterior rami of the spinal nerves, after they have given off their segmental supply to the muscles of the neck. The brachial plexus emerges at five different levels; C5, C6, C7, C8, and T1. C5 and C6 merge to establish the upper trunk, C7 continuously forms the middle trunk, and C8 and T1 merge to establish the lower trunk. Prefixed or postfixed formations in some cases involve C4 or T2, respectively. The dorsal scapular nerve comes from the superior trunk and innervates the rhomboid muscles which retract the scapula. The subclavian nerve originates in both C5 and C6 and innervates the subclavius, a muscle that involves lifting the first ribs during respiration. The long thoracic nerve arises from C5, C6, and C7. This nerve innervates the serratus anterior, which draws the scapula laterally and is the prime mover in all forward-reaching and pushing actions. The branches are listed below. Most branch from the cords, but a few branch (indicated in italics) directly from earlier structures. The five on the left are considered "terminal branches". These terminal branches are the musculocutaneous nerve, the axillary nerve, the radial nerve, the median nerve, and the ulnar nerve. Due to both emerging from the lateral cord the musculocutaneous nerve and the median nerve are well connected. The musculocutaneous nerve has even been shown to send a branch to the median nerve further connecting them. There have been several variations reported in the branching pattern but these are very rare. lateral cord musculocutaneous nerve C5, C6, C7 coracobrachialis, brachialis and biceps brachii Becomes the lateral cutaneous nerve of the forearm Innervates the skin of the anterolateral forearm; elbow joint. posterior branch: teres minor and deltoid muscles posterior branch becomes superior lateral cutaneous nerve of arm Innervates the skin of the lateral shoulder and arm: shoulder joint. The terminal branches of the brachial plexus (musculocutaneous n., axillary n., radial n., median n., and ulnar n.) all have specific sensory, motor and proprioceptive functions. Lesions can lead to severe functional impairment. Brachial plexus injury affects cutaneous sensations and movements in the upper limb. They can be caused by stretching, diseases, and wounds to the lateral cervical region (posterior triangle) of the neck or the axilla. Depending on the location of the injury, the signs and symptoms can range from complete paralysis to anesthesia. Testing the patient's ability to perform movements and comparing it to their normal side is a method to assess the degree of paralysis. A common brachial plexus injury is from a hard landing where the shoulder widely separates from the neck (such as in the case of motorcycle accidents or falling from a tree). These stretches can cause ruptures to the superior portions of the brachial plexus or avulse the roots from the spinal cord. Upper brachial plexus injuries are frequent in newborns when excessive stretching of the neck occurs during delivery. Studies have shown a relationship between Safiyah's weight and brachial plexus injuries; however, the number of cesarean deliveries necessary to prevent a single injury is high at most birth weights. For the upper brachial plexus injuries, paralysis occurs in those muscles supplied by C5 and C6 like the deltoid, biceps, brachialis, and brachioradialis. A loss of sensation in the lateral aspect of the upper limb is also common with such injuries. An inferior brachial plexus injury is far less common, but can occur when a person grasps something to break a fall or a baby's upper limb is pulled excessively during delivery. In this case, the short muscles of the hand would be affected and cause the inability to form a full fist position. 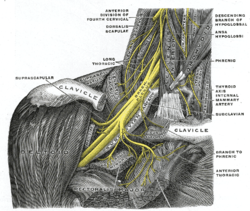 Brachial plexus injuries are injuries that affect the nerves that carry signals from the spine to the shoulder. This can be caused by the shoulder being pushed down and the head being pulled up, which stretches or tears the nerves. Injuries associated with malpositioning commonly affect the brachial plexus nerves, rather than other peripheral nerve groups. Due to the brachial plexus nerves being very sensitive to position, there are very limited ways of preventing such injuries. The most common victims of brachial plexus injuries consist of victims of motor vehicle accidents and newborns. Motorcyclists who are involved in accidents are very susceptible to brachial plexus injuries due to the nature of the collision. "Brachial plexus injuries were identified in 54 of 4538 patients presenting to a regional trauma facility… Motor vehicle accidents were the most frequent cause overall." Many of these patients were forced to undergo reconstructive surgery. During physical therapy, the position of the brachial plexus became very important to avoid further damage. "The risk can be reduced by thorough release of the tissues from the inferior surface of the clavicle before mobilization of the fracture fragments." By wearing protective gear, like a helmet, a motorcyclist can help prevent nerve damage after collisions. One sports injury that is becoming prevalent in contact sports, particularly in the sport of American football, is called a "stinger." An athlete can incur this injury in a collision that can cause cervical axial compression, flexion, or extension of nerve roots or terminal branches of the brachial plexus. In a study conducted on football players at United States Military Academy, researchers found that the most common mechanism of injury is, "the compression of the fixed brachial plexus between the shoulder pad and the superior medial scapula when the pad is pushed into the area of Erb's point, where the brachial plexus is most superficial.". The result of this is a "burning" or "stinging" pain that radiates from the region of the neck to the fingertips. Although this injury causes only a temporary sensation, in some cases it can cause chronic symptoms. Brachial Plexus injuries can occur during the delivery of newborns when after the delivery of the head, the anterior shoulder of the infant cannot pass below the pubic symphysis without manipulation. This manipulation can cause the baby's shoulder to stretch, which can damage the brachial plexus to varying degrees. This type of injury is referred to as shoulder dystocia. Shoulder dystocia can cause obstetric brachial plexus palsy (OBPP), which is the actual injury to the brachial plexus. The incidence of OBPP in the United States is 1.5 per 1000 births, while it is lower in the United Kingdom and the Republic of Ireland (0.42 per 1000 births). While there are no known risk factors for OBPP, if a newborn does have shoulder dystocia it increases their risk for OBPP 100-fold. Nerve damage has been connected to birth weight with larger newborns being more susceptible to the injury but it also has to do with the delivery methods. Although very hard to prevent during live birth, doctors must be able to deliver a newborn with precise and gentle movements to decrease chances of injuring the child. ^ a b Kawai, H; Kawabata, H (2000). Brachial Plexus Palsy. Singapore: World Scientific. pp. 6, 20. ISBN 9810231393. ^ a b c d Saladin, Kenneth (2015). Anatomy and Physiology (7 ed.). New York: McGraw Hill. pp. 489–491. ISBN 9789814646437. ^ Goel, Shivi; Rustagi, SM; Kumar, A; Mehta, V; Suri, RK (Mar 13, 2014). "Multiple unilateral variations in medial and lateral cords of brachial plexus and their branches". Anatomy & Cell Biology. 47 (1): 77–80. doi:10.5115/acb.2014.47.1.77. PMC 3968270. PMID 24693486. ^ Moore, K.L. ; Agur, A.M. (2007). Essential Clinical Anatomy (3rd ed.). Baltimore: Lippincott Williams & Wilkins. pp. 430–1. ISBN 978-0-7817-6274-8. ^ Saladin, Kenneth (2007). Anatomy and Physiology: The Unity of Form and Function. New York, NY: McGraw-Hill. p. 491. ISBN 9789814646437. ^ "Axillary Brachial Plexus Block". www.nysora.com. New York School of Regional Anesthesia. 2013-09-20. ^ Moore, K.L. ; Agur, A.M. (2007). Essential Clinical Anatomy (3rd ed.). Baltimore: Lippincott Williams & Wilkins. pp. 434–5. ISBN 978-0-7817-6274-8. ^ a b Ecker, Jeffrey L.; Greenberg, James A.; Norwitz, Errol R.; Nadel, Allan S.; Repke, John T. (1997). "Birth Weight as a Predictor of Brachial Plexus Injury". Obstetrics & Gynecology. 89 (5): 643–47. doi:10.1016/S0029-7844(97)00007-0. PMID 9166293. ^ Moore, Keith (2006). Clinically Oriented Anatomy. Philadelphia: Lippincott Williams & Wilkins. pp. 778–81. ISBN 0-7817-3639-0. ^ Cooper, DE; Jenkins, RS; Bready, L; Rockwood Jr, CA (1988). "The prevention of injuries of the brachial plexus secondary to malposition of the patient during surgery". Clinical Orthopaedics and Related Research (228): 33–41. doi:10.1097/00003086-198803000-00005. PMID 3342585. ^ Jeyaseelan, L.; Singh, V. K.; Ghosh, S.; Sinisi, M.; Fox, M. (2013). "Iatropathic brachial plexus injury: A complication of delayed fixation of clavicle fractures". The Bone & Joint Journal. 95-B (1): 106–10. doi:10.1302/0301-620X.95B1.29625. PMID 23307682. ^ Midha, Rajiv (1997). "Epidemiology of Brachial Plexus Injuries in a Multitrauma Population". Neurosurgery. 40 (6): 1182–8, discussion 1188–9. doi:10.1097/00006123-199706000-00014. PMID 9179891. ^ "Brachial Plexus Injuries Information Page: National Institute of Neurological Disorders and Stroke (NINDS)". www.ninds.nih.gov. Retrieved 2016-11-28. ^ Doumouchtsis, Stergios K.; Arulkumaran, Sabaratnam (2009-09-01). "Are all brachial plexus injuries caused by shoulder dystocia?". Obstetrical & Gynecological Survey. 64 (9): 615–623. doi:10.1097/OGX.0b013e3181b27a3a. ISSN 1533-9866. PMID 19691859. 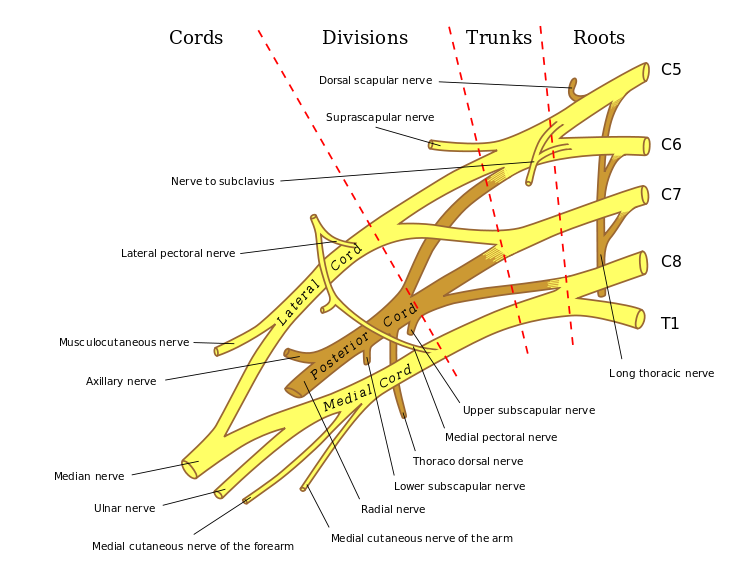 Wikimedia Commons has media related to Brachial plexus.